Once you start setting up separate blogs for your students, you’ll likely want to link them all together on your class blog, since doing so will let your original class blog act as a hub for your class’s online blogging community. A blogroll basically refers to a set of links to your student blogs on your class blog. Other bloggers frequently use blogrolls to list other blogs, such as affiliates and favourites, and they help to consolidate your class’s efforts and point readers towards other content which they might find interesting. To create your blog roll, you’ll be using links and widgets on your class blog, as explained in this chapter. In your administrator dashboard, navigate to “Links > Add New”. Enter the full URL for the blog you want to add, and enter the student’s first name in the “Name” field. If you need to distinguish between two or more students with the same first name, try adding the initials of their surnames as well. The name of the blog will also be the clickable link which will take readers to that student’s blog. Under “Categories,” a little further down the page, be sure to check the box beside “Blogroll”. Finally, click “Add Link” to save the information. You can further organize your blogroll by creating different categories, which can be particularly useful for educators with multiple classes. To add a new category, click “+Add New Category,” enter a name and click “Add”. Select the new category as required whenever you create a new link to one of your student’s blogs. If you want to delete or edit existing links, you can do so by navigating to “Links > All Links,” moving the mouse over the link you wish to edit and clicking “Edit”. To save your changes, click on “Update Link”. 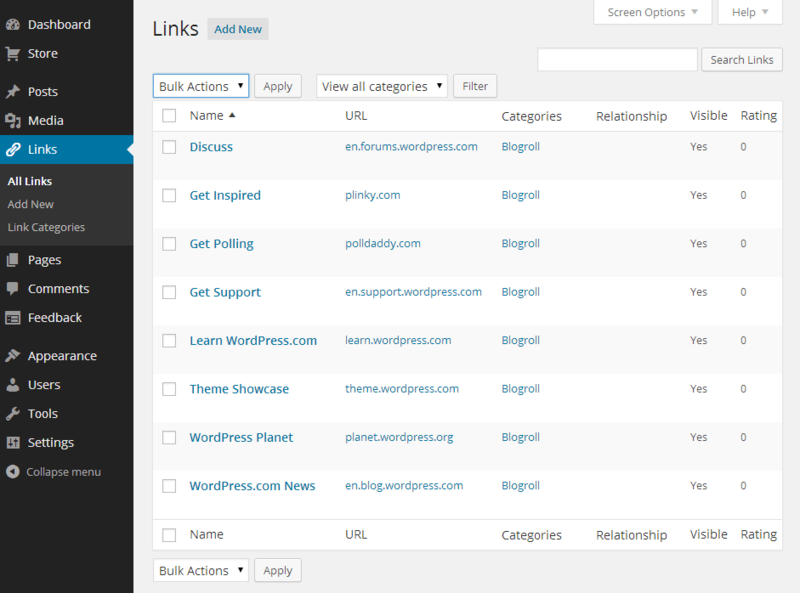 If you want to delete multiple links, such as the default ones included with a standard blog hosted at wordpress.com, simply select the boxes beside the links you wish to remove and choose “Delete” from the dropdown box labelled “Bulk Actions”. Click “Apply” to make the changes. Now that you’ve added the links to your students’ blogs to your administrator dashboard, you’ll want to have them appear on your blog itself so that your readers will be able to see them. 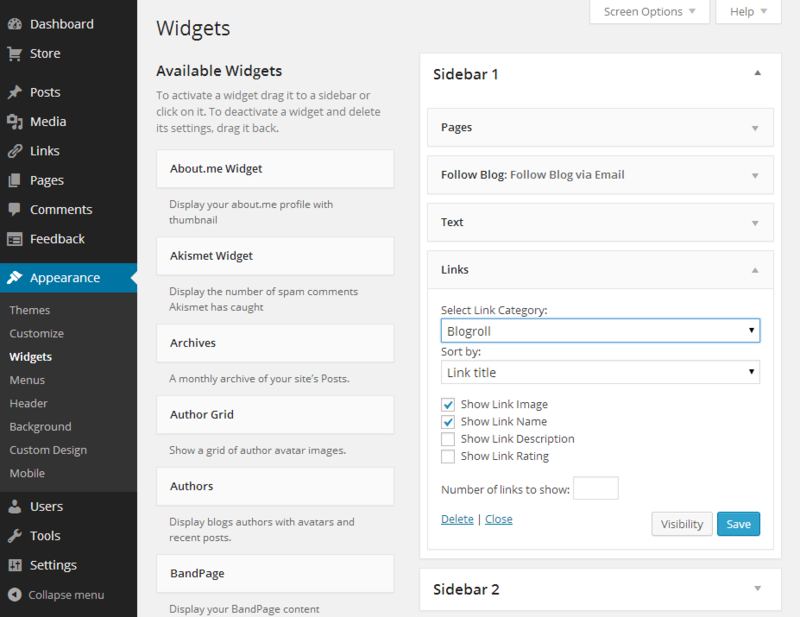 We will be using the Links widget to display your blogroll, so you’ll need to navigate to “Appearance > Widgets” in the dashboard. Drag and drop the “Links” widget from the left-side column to the sidebar widget to the right. 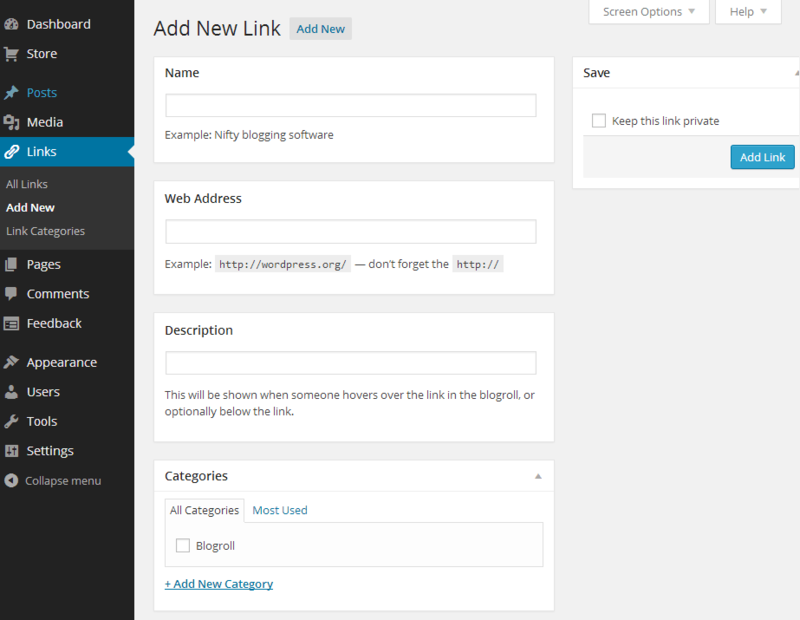 Choose the category for the links which you want to add (such as Blogroll) from the dropdown box and click “Save”. If you want to display multiple categories, such as one for each class, you’ll need to add multiple instances of the widget, selecting categories as required for each one. Your blogroll will appear immediately on your class blog.